At the corner of 45th St and 4th Ave NE, we have the largest wine store in the Pacific Northwest (also sporting a fine collection of spirts), an award-winning tattoo parlor and now, to complete the trifecta, the American Mary retail marijuana store opened its doors this past week. Our Gateway to Wallingford is almost complete! Owned by experienced dope salesman Donnie Douglas, American Mary has nestled into one of the few blocks in Wallingford where retail marijuana can legally operate (yes, it’s just far enough away from the John Stanford School to qualify). I’ve been curious how the retail marijuana business is going to shake out (no pun intended): after the hoopla is over, what’s going to distinguish American Jane from Hashtag or any of the other retail marijuana shops. They all have access to basically the same products, right? I asked Donnie if he thought pot would basically become a commodity. He felt that American Mary had more to offer, because of the long history his staff has had in the industry. American Mary will also take advantage of the fact that they are replacing Puffin Glass, which specialized in locally hand-crafted glass bongs, pipes and other accessories. 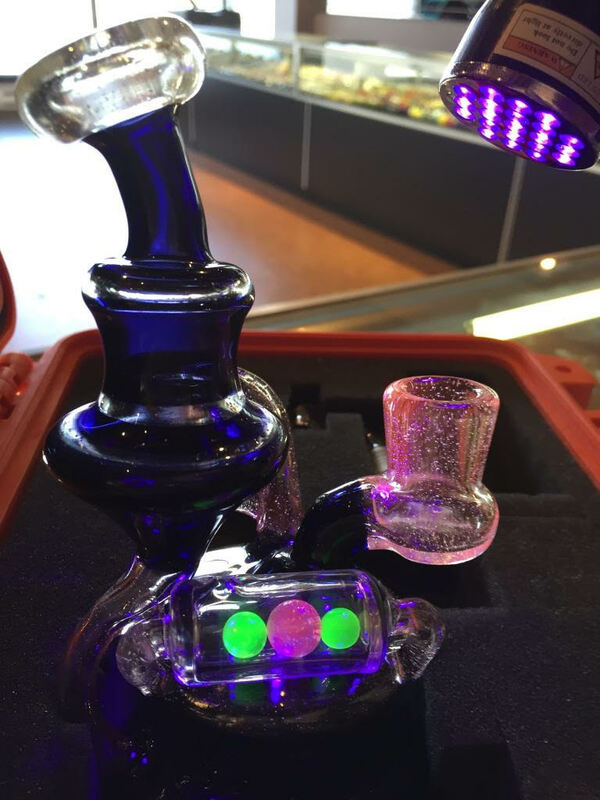 American Mary offers a rich assortment of glassware from Puffin Glass Studios, including the black light beauty pictured above. Well, come on over to the other side (of Wallingford, or arguably Fremont), where we have three stores. I’d be interested see if you can pick up on any differences. There are differences for sure, but it’s hard to say how important they are. It’s really way early in the game. We’re about a year into it, and still almost completely influenced by the pre-502 cultural background, basically black market/medical. My theory is that cultural adaptation is going to take off in directions that are different in important ways. The retailers are in a key place in that, some of them will play a role (and of course some won’t.) I’m not sure whether previous experience in “the industry” is an asset, or a liability. There’s so much more fetishizaton and ritualization around pot than booze. People dedicate their whole lives and lifestyles to being burnouts or potheads. It’s sort of pathetic, but so are alcoholics. I don’t actually know anyone like that, but if you do, ask them what they think of I-502. As you imply, it’s not the drug, it’s the culture. Like with alcohol, where for example Italians have abundant access to alcohol in various forms but aren’t prone to binge drinking or public drunkenness, but in Belarus over a third of deaths are alcohol related. Cannabis is much more interesting than alcohol – more pharmacological variation, more psychoactive complexity – and we’re breaking the trail, first legal state(s) in the modern world. It could be interesting, if anyone has any imagination.